My initial thoughts: Oh, no, not another metalcore/grind outfit. My second: Heureka! This is something different! The debut release from Australia's A Million Dead Birds Laughing (AMDBL) turns out to be like a gust of fresh air from southern shores. Yes, the foundation for this is grind, perhaps with a tad of Morbid Angel, but the Australians do so much more and work with the genre boundaries in a way that is well-worth a listen. Do the unspected seems to be the recipe, and AMDBL certainly follow the recipe. The first few seconds, you think you're on safe ground, then the next moment, vocalist AZ makes a new voice or the tempo moves into weird mode or whatever. You basically have no clue what hits you around the next corner. I can see days where the whole thing is just too schizophrenic for me, but still, I sense there's a brutal, red thread throughout, and it calls for more listening. This is one of those albums that offers something new every time you listen, and I'm not saying that it's not demanding on the listener. 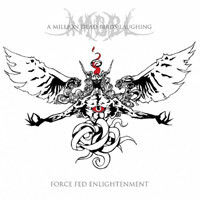 'Force Fed Enlightenment' is a collection of 24 crazy yet well-spent minutes of your life. 25 minutes could be too much, I'm not sure, however, the 24 minutes are extremely interesting and enjoyable! Take the ride!